Champagne and Formula 1, when the story began? Let’s recall the key events of this sparkling and exciting connection, which combines the speed of racing with the elegance of Champagne! The marriage between Champagne and Formula 1 comes from the 50’s, July 2nd 1950, when the legendary Juan Manuel Fangio, after winning the French Grand Prix at Reims-Gueux, received a bottle of prestigious Champagne from Moët & Chandon as a gift. 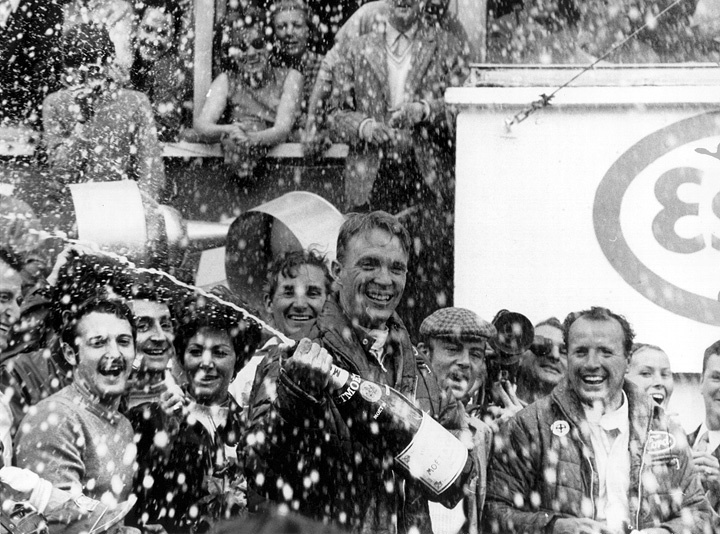 However, the well-known “Champagne Spray” gesture, which is the act of spraying the precious sparkling wine from the podium, was born by accident ten years later, precisely in 1966: the driver Jo Siffert, winner of the 24 Hours of Le Mans, sprinkled bubbles on the public opening his bottle of Champagne, probably shaken before. But the rite itself was born the following year, in 1967, always at Le Mans, when the winner Dan Gurney sprayed his Champagne on the marveled audience near the podium. Since that, the drivers began to emulate that gesture and it became an habit, especially in F1! Dan Gurney on the Le Mans podium. It was the 11th of July ’67. Now let’s focus onto Champagne: in Formula 1 only Moët & Chandon’s Brut Imperial and Mumm’s Cordon Rouge. Moët Chandon has been linked to Formula 1 from 1966 until 1999, by signing more than 30 years of success. 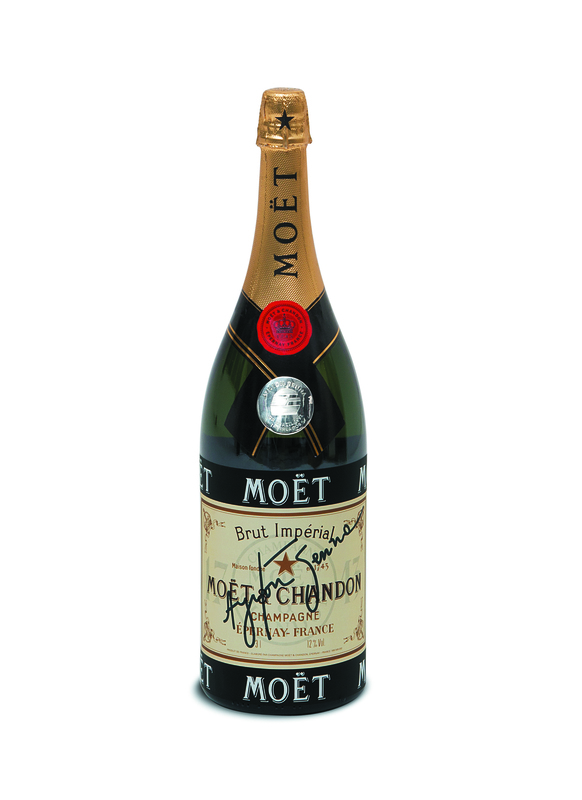 The Champagne provided by Moët & Chandon is the Brut Imperial, in the size of a Jeroboam, a bottle of 3 liters. The Cuvée Brut Imperial is a Sans Anne (non-vintage), composed in percentage of Chardonnay, Pinot Noir and Pinot Meunier, which vary from year to year, in such a way as to maintain the characteristics of this Champagne as constant as possible over time: if you drink it this year and in 10 years, you’ll probably recover some of the same perfumes and flavors! In addition, this Champagne celebrated the F1 drivers world championship 4 times with Alain Prost and 3 times with Ayrton Senna: two unforgotten legends in this category. Alain Prost and Ayrton Senna celebrate with Brut Imperial. So much so that, recently, to celebrate the achievements of the 41 Ayrton’s GP wins, the same French maison Moët & Chandon has released 41 limited edition bottles, replicas of those shaken on the podium during those years. F1 Brut Imperial replica, in the limited “Ayrton Senna” edition. 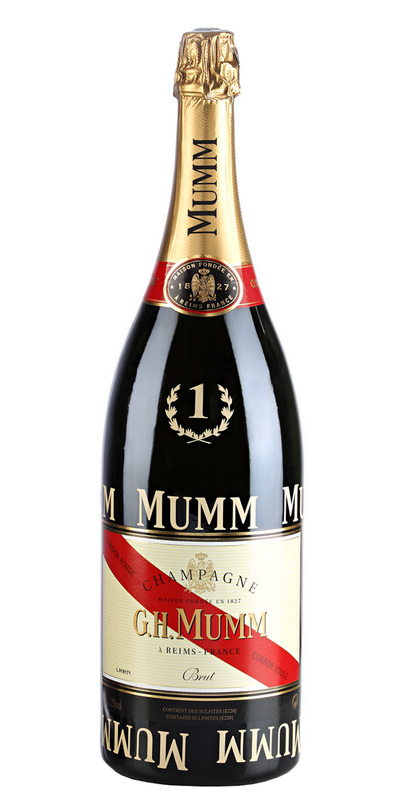 Mumm has marked the history of the F1 last decade. His Cordon Rouge, in size of a Jeroboam also, wet the F1 podiums from 2000 until today. The Cordon Rouge, as the Brut Imperial, is also a Cuvée Sans Anne, composed in percentage of Chardonnay, Pinot Noir and Pinot Meunier which vary from year to year, in order to maintain the quality at a constant level over the time. 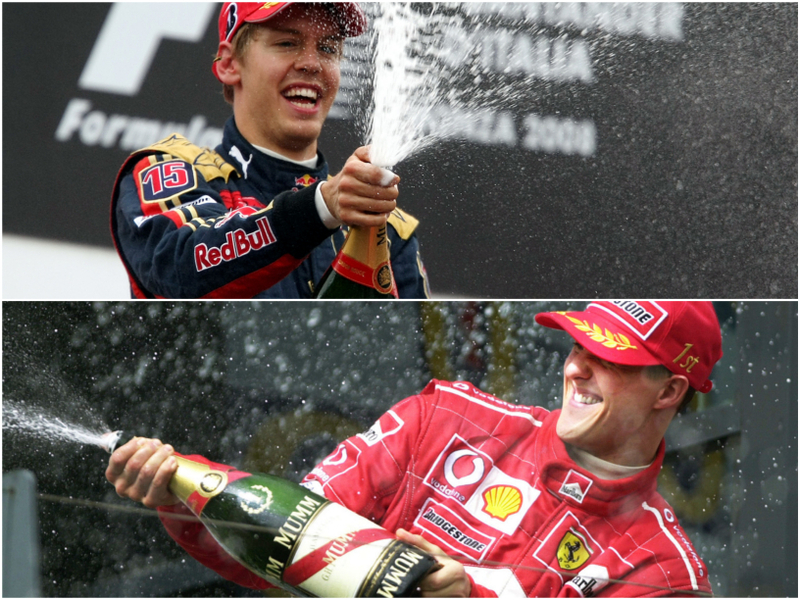 The Mumm Cordon Rouge has been a spectator of the world triumphs of Michael Schumacher, 5 times, and Sebastian Vettel, 4 times. 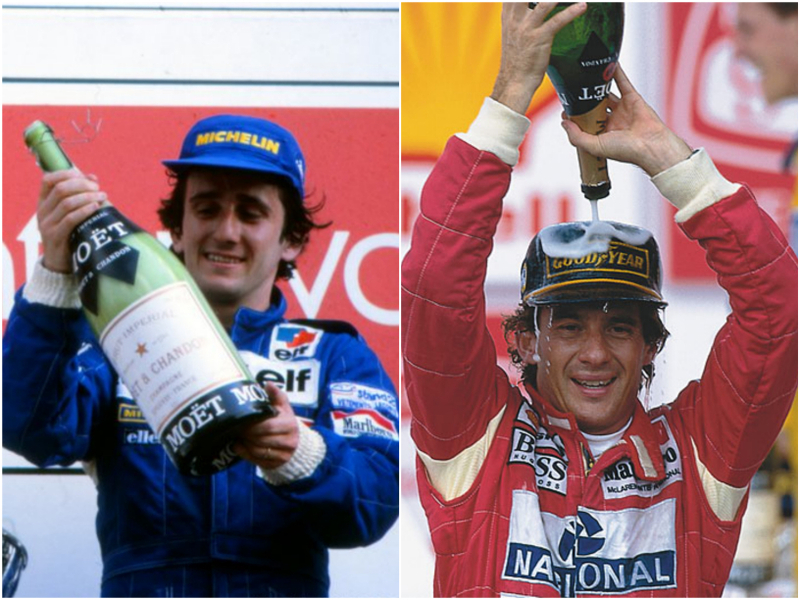 Michael has also triumphed twice before, in 1994 and 1995, celebrating with the bubbles of Moët & Chandon instead of Mumm! Sebastian Vettel and Michael Schumacher celebrate with Cordon Rouge.